No grid, no averaging, only one position at a time. This is a mean reversion strategy around the close of the New York session. It is only designed for symbols: EURUSD, GBPUSD, EURCHF and USDCHF on M5 timeframe. There are also auto settings EURGBP, but I am not using it on my signal account. 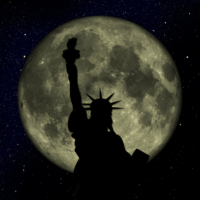 Because the EA will trade around the New York close time (16:00 – 18:00 New York time), the GMT time will be different in summer compared to winter (DST: daylight saving time). But the EA has daylight saving times stored internally, so there is no need to adjust the trading hours manually. For backtest you should use GMT offset 0 (or set testerGMToffset to the correct value) and don’t adjust for DST, the EA will do the adjustment itself. Because this strategy is trading around swap time the spread can be very large. 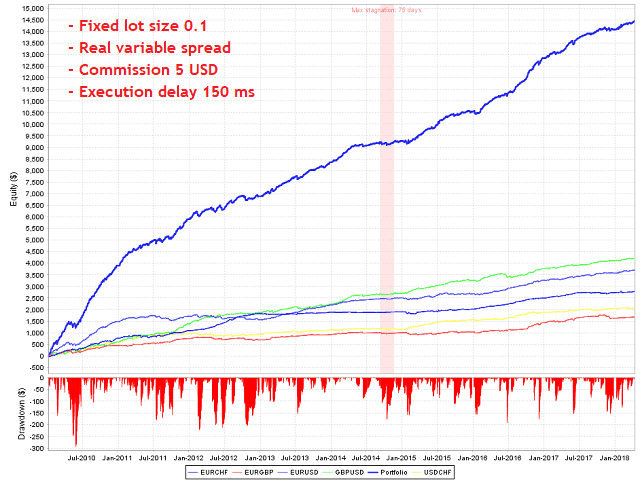 It is important to use real spread in backtesting and not some fixed spread. But be aware that the spread can be very different between brokers at that time. The EA should be turned off on days of important events, for example general elections in UK, US or Europe! Be aware that past performance is no guarantee of future profitability and that optimized backtest results cannot provide a realistic prediction of future profitability. orderComment – Each trade will show this comment in history tab. magicNumber – individual magic number. The EA will only manage position of the chart symbol with this magic number. lotType – “fixed” or “increasing”, where the lot size is calculated automatically. fixLots – fixed lot size in case lotType = fixed. lotStep – how much the lot size should be increased every equityPerStep (if lotType = increasing). equityHardStop – if the equity falls below that level the EA will close open positions (only of this strategy) and will not open any new positions. pipInPoints – for 5-digit brokers, this should be 10, for 4-digit brokers 1.
slippagePoints – Slippage used in OrderSend() function (points, not pips). maxSpreadPips – maximum spread allowed for entry. If smaller 0, auto settings will be used, which are different for each currency pair. liveGMToffset – To set GMT offset manually. Usually this is not needed. skipSunday – if true the EA will not open positions on Sunday (GMT). startHourGMT – when to start trading (GMT). 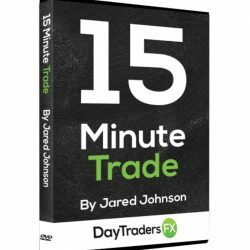 endHourGMT – when to stop trading (GMT). waitMinutesBetweenEntries – The EA will not check for new positions during the given duration. If you are sleeping during the trading hours you could limit the potential total risk with this parameter. If the last hour was a loss the EA will automatically increase waitMinutesBetweenEntries by 15 minutes. dontTradeTripleNegativeSwap – If true, the EA will not open trades on before swapHourGMT when the swap is negative on days with triple swap rate. tripleSwapDay – Day at which tripple swap is applied. On most borkers it is Wednesday. swapHourGMT – Swap hour used if dontTradeWednesdayNegativeSwap=true. testerGMToffset – Only needed for tester because GMT time is not defined in tester and your bar data might have a GMT offset. Please also have a look at the “What’s new” tab for additional parameters.